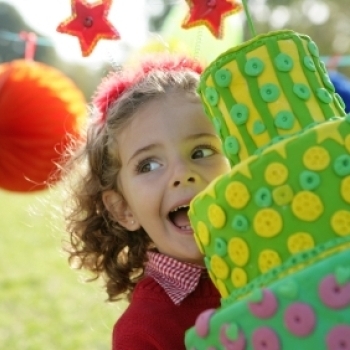 When it comes to birthday parties, you'll find that your little ones are easy to please. As a matter of fact, toddlers will be blissfully happy with a simple, short (one- to one and a half hour) party. Choosing a favorite theme to center your child's party around will help you to coordinate invitations, linen, decor, games and a cake. At this age, a theme does not need to be elaborate; a simple concept such as a color or shape, favorite character or storybook can be the focal point for your decorations and activities. While kids usually have no problem entertaining themselves at parties, sometimes you need a bit of help. Party entertainers like clowns, magicians and face-painters help break the ice and when kids are laughing and enjoying themselves without pressure; it's so much easier for them to really enjoy the party. Hiring a jumping castle is also a sure winner when entertaining small kids. Begin planning your party 4-5 weeks in advance. This will allow plenty of time for purchasing those themed cups, plates and party hats, placing the cake order and enlisting any friends or family you may want to assist. Pick a theme. Whether it's an elaborate ‘under the sea’ theme, or something easier, like your child's favorite character, selecting a theme will help you organize your thoughts. You'll then plan all of your party supply purchases, party games and decorations around that theme. Children remember what they did at a party, much more than what they ate, what the plates and napkins looked like or whether the house was spotless. Don't sweat the little details! The best party times are between 13H00 – 15H00 to work around nap time. You won't need to serve a meal but a few finger foods are advised. It is up to you to decide how many kids you can handle, but the general rule of thumb is the child’s age + 1. It's not mandatory that you invite the siblings of your child's friends, or even parents (unless children are very young). Most parents enjoy the break and you won't feel so much pressure to entertain adults. Select games where everyone gets a chance to succeed. For example, plan a few games in which the whole gang faces a challenge, such as following a treasure map and when they find the treasure they each receive a prize or split the treasure evenly. Remember to have fun and enjoy the celebration of your child's birth!